LFW is an innovator in the design of custom gearboxes and gear sets for an array of industrial applications. LFW is located in Stockton California and has been in business for more than 28 years. 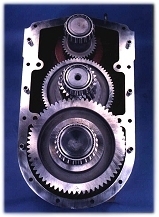 LFW developes a wide variety of gears and gear boxes for many different industries. LFW also provides a heavy duty line of gearboxes for steam turbine reduction. These gear boxes range from 300 to 3500 horsepower in a broad variety of speeds. Due to out low overhead LFW can manufacture quality one off and low production custom gear boxes at a fraction of the competitions prices. LFW Manufacturing offers a full range of gear cutting and machining services including fabrication, milling, turning, hobbing, gear shaping, bevel gear cutting, grinding, assembly and testing. © Copyright LFW Manufacturing, 2001.